Learn a few easy chords and sing some songs it’s great fun ! ! We have a couple of spare Ukuleles Why not give it a try! 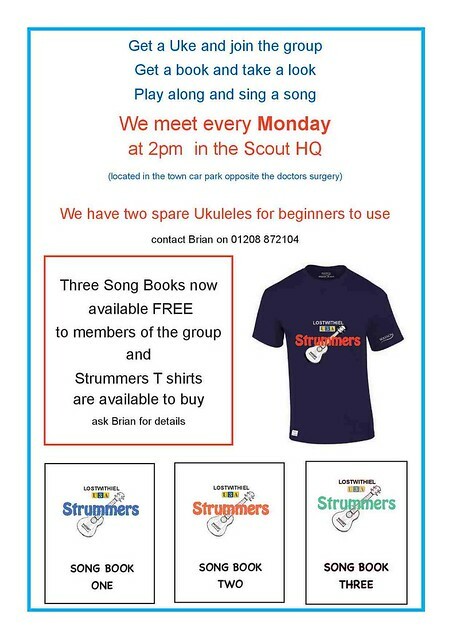 At an extended meeting a Christmas Party held in the Scout HQ on 17th December 40 Strummers enjoyed an afternoon of Ukulele and song with a break for food and drink supplied by the members. We were also entertained by Carol and Malcolm Nevard; Mike Fieldhouse; Carolyn and Mike Marshall; Jane Stoneham, Rosie Smith, Angela and Stewart Walker. Also thank you to our special guest Keith Southgate for the photograph. 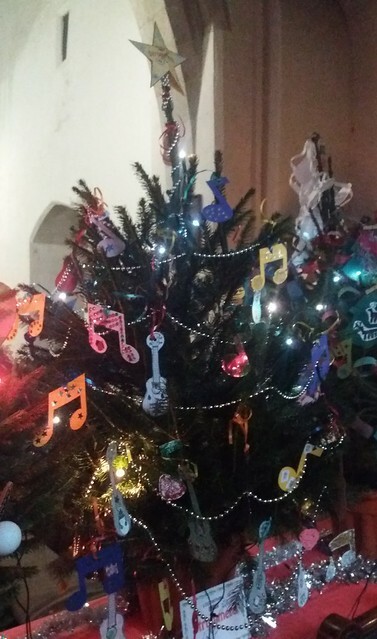 Lostwithiel U3A Strummers are pleased to be one of 32 local organisations sponsoring a tree at the Christmas Tree Festival in St Barts Church. The trees may be viewed daily from 10.00am until 4.00pm. 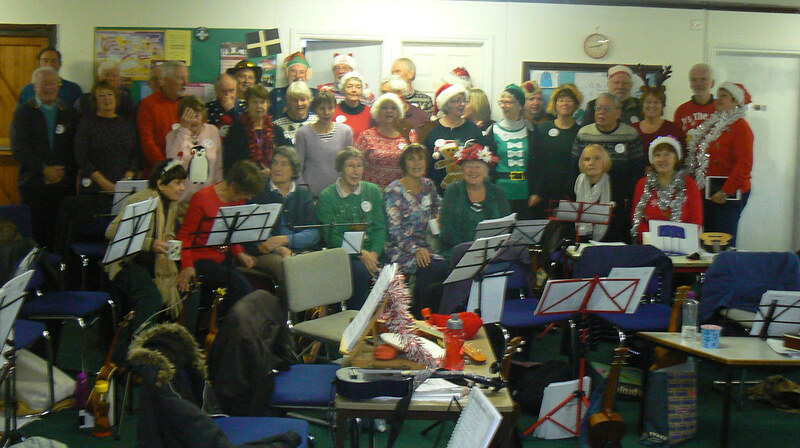 At the Strummers meeting on Monday 10th December 2018 Thirty four group members wished bon voyage to Derek Babb who is leaving Lostwithiel to be near to his family in Cambridegshire. Derek joined the Strummers in 2014 and has been a regular attender to Strummers meeting and concerts. To wish him on his way instead of the usual tea and biscuits we indulged ourselves with lovely mince pies, Christmas brownies and chocolates. Seventeen Strummers played their Ukes and sang songs to residents at Woodland House Care Home St. Austell. 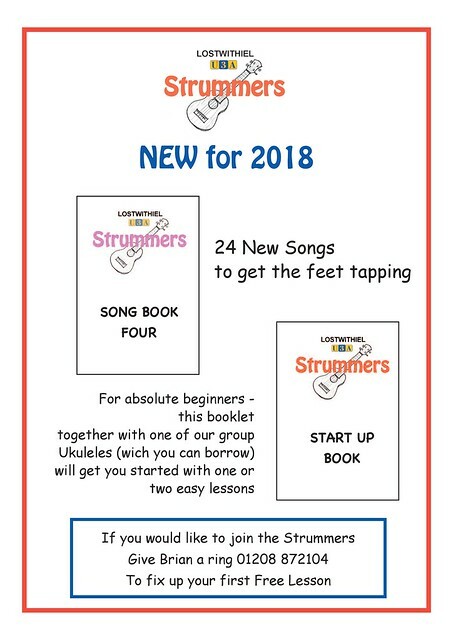 As ever the Strummers performed with aplomb doing 20 songs starting with Yes Sir That’s My Baby and finishing with when the Saints go Marching in. 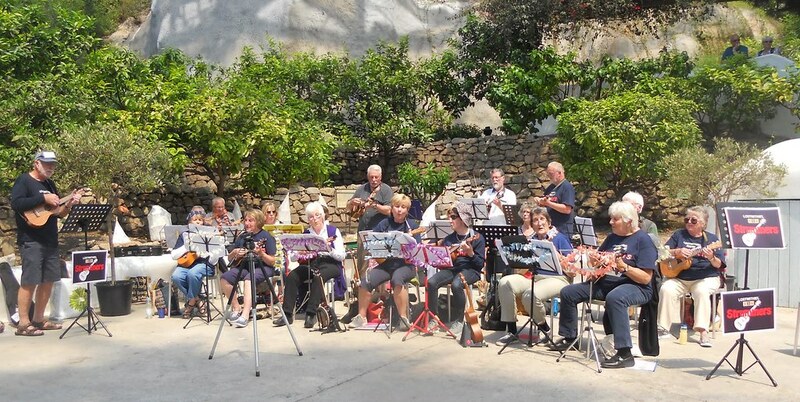 The performance was appreciated by residents and staff alike. 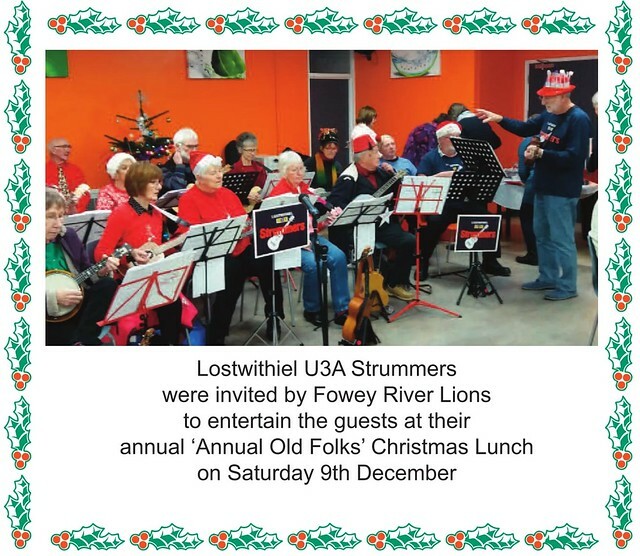 Lostwithiel U3A Strummers were invited by the Eden Project community team to entertain members of the Eden Lunch Club in the main restaurant next to the Med Biome. 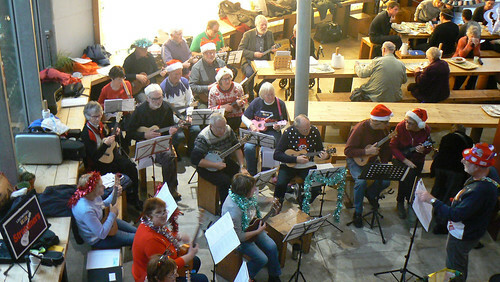 The Strummers gave a splendid performance which was well received by members of the Lunch Club, Eden staff and visitors . 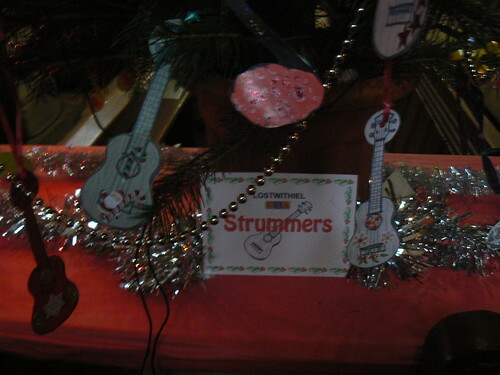 On Monday 18th December 2017 we held our 4th Strummers Christmas Party in the Scout HQ. 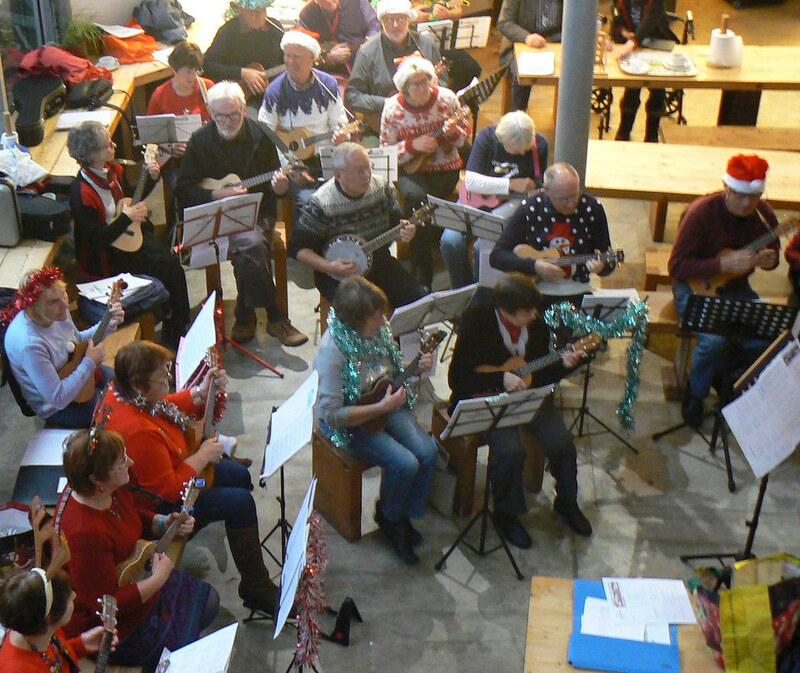 Thirty two Strummers and a few guests enjoyed a gourmet feast and over 2 hours of fun singing and ukulele playing. 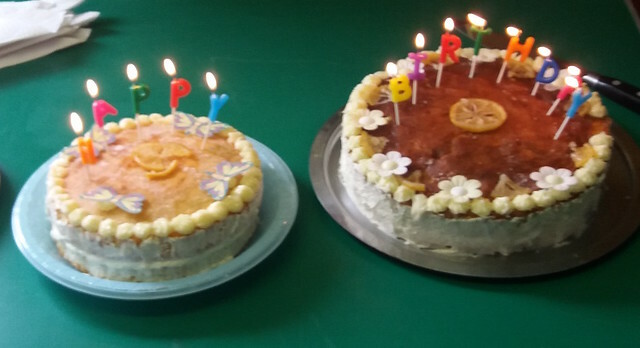 Strummers members Derek Babb (83) and Pam Manasseh (85) celebrated their Octogenarian Birthdays at the meeting held on 18th September 20017. 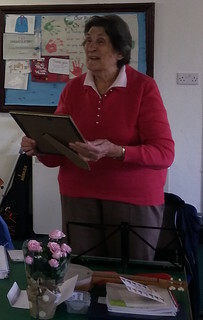 We had two lovely cakes baked by Rosie Smith and presentation of cards and a certificate. 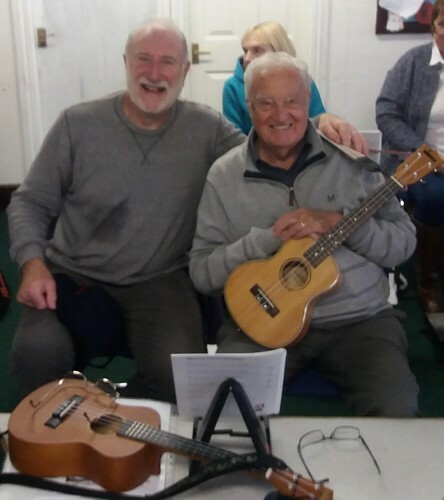 Both members started playing the Ukulele just a few years ago when they joined the group - It’s never too late to start doing something new!